CANNON BALL, N.D. - The crowdsourcing goal was modest: $5,000, enough to help a few dozen people camping in North Dakota to protest the nearby construction of the four-state Dakota Access oil pipeline. The fund has since topped a staggering $1 million. The fund is among several cash streams that have provided at least $3 million to help with legal costs, food and other supplies to those opposing the nearly 1,200-mile pipeline. 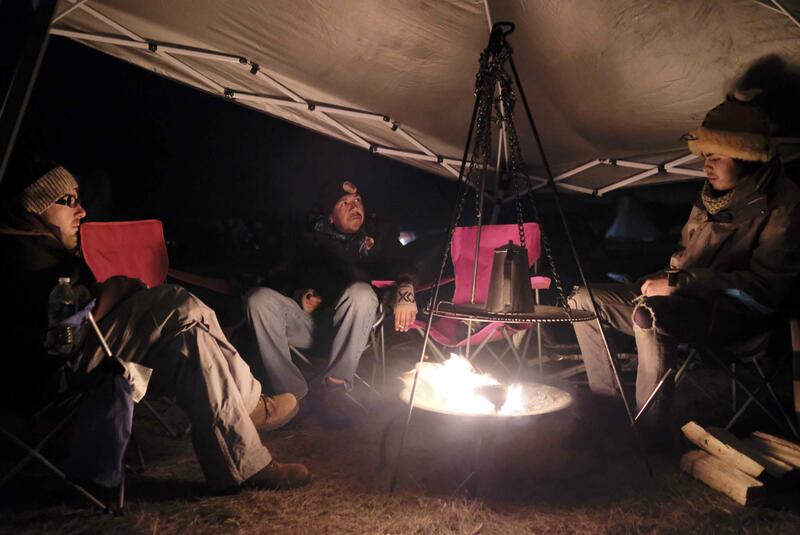 It may also give protesters the ability to prolong their months-long encampments that have attracted thousands of supporters, as the Standing Rock Sioux Tribe pursues the fight in court. And as the number of protest-related arrests increased this week, so did contributions - the funds raked in more than $200,000 between Thursday and Friday alone. But demonstrators are quick to note that the amount of money raised and what they have left isn’t the same. “It still feels unreal sometimes because it is such an astronomical figure to me,” said Ho Waste Wakiya Wicasa, the protester who set up the GoFundMe account that has raised more than $1 million mostly for operating expenses at the camp, which took root in April. “The money goes as quickly as it comes, but without it having been as much as it is, we certainly wouldn’t have been able to be as productive as we have been in the fight,” he said. For months now, opponents of the $3.8 billion pipeline - which is slated to move oil from North Dakota through South Dakota and Iowa to a shipping point in Illinois - have been camping near the confluence of the Missouri and Cannonball rivers. They worry the project will disrupt cultural artifacts and hurt drinking water sources on the Standing Rock Sioux’s nearby reservation and farther downstream because the pipeline will cross the Missouri River. The Texas-based company building the pipeline, Energy Transfer Partners, insists the project is safe. The tribe is fighting the pipeline’s permitting process in federal court. Since the number of protesters soared in August in North Dakota, donations started rolling in more frequently and more than 400 people have been arrested - including more than 140 on Thursday when officers evicted protesters camping on private land recently acquired by Energy Transfer Partners. But running a camp - and readying it for North Dakota’s brutal winter - isn’t cheap. The account Wicasa set up has only about $100,000 left as of Friday night, according to LaDonna Brave Bull Allard, a tribal historian and preservation employee. She provided family land for use in the original camp, Sacred Stone, in April and still houses demonstrators. The money has been used for grocery store trips every two days that cost about $2,000 each, 20 yurts purchased for $160,000, and around $7,000 for bail money. It has also paid for a storage area, composting toilets, tiny houses, tepees, a medical area and generators powered by solar panels and wind. A bookkeeper and an accountant now keep track of the crowd-sourced money. Meanwhile, much of the money the tribe is using for the legal fight is from at least $1.3 million in direct donations, tribal chairman Dave Archambault recently told The Associated Press. He declined to say how much tribal officials have spent so far, saying that could give their opponents an advantage in the legal case. Energy Transfer Partners also has declined to provide an estimate of its legal expenses. The tribe is pursuing appeals after losing in lower courts. The Standing Rock Sioux didn’t solicit money, Archambault said, but asked other tribes for letters of support or formal resolutions. He said it was only after other tribes, including the Red Lake Nation and the Shakopee Mdewakanton Sioux Community in Minnesota, inquired about financial contributions that leaders decided to accept money for legal costs. And as the protests continued, the tribe decided to also use part of the money for waste-management services for protesters, he said. Among the donors to online fundraisers is southern New Hampshire resident Carol DiPirro. She gave $30, motivated in part because of a fight her community waged against a natural gas pipeline.